It was only on the early days of August, we could at last complete the report on the accomplishment of the IEEE CYBERNETICSCOM and the IEEE COMNETSAT, and sent it to the IEEE. On the same month last year, we began to plan these conferences. However, the preparation and execution of the IEEE TENCON 2011 has inevitably delayed the preparation of these twin conferences. So at the beginning of this year, we started distributing information on COMNETSAT and CYBERNETICSCOM. The papers started to come, but we received the majority of papers in injury time just before April. Luckily we’ve got strong supports from the organisations and from our colleagues. IEEE sent its Letters of Acquisition to each conference rather quickly. 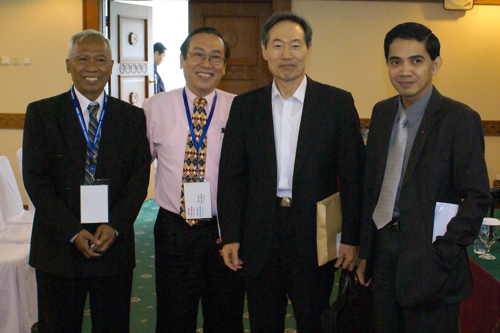 They seemed impressed by the success of the IEEE TENCON 2011 we carried out last year. The former president of the IEEE and the IEEE Communication Society gave their willingness to present as Keynote Speakers. We then organised the Technical Programme Committee, and began inviting the Track Chairs from universities and institutions. The track chairs, as the guardians of the conference quality, then did their first tasks to select the paper reviewers. Those reviewers went on duty to review the papers and to submit the results. At the end of May, the paper authors have received the results of their submissions. Only about 50% of the papers are passed in this stage. Then the authors had only a short time to fix the paper according to reviewers’ feedback. Meanwhile, the conference organisers started to prepare the event conferences. With the adrenaline triggered the pursuit of quality and time, we finally left for Denpasar. The show must go on. 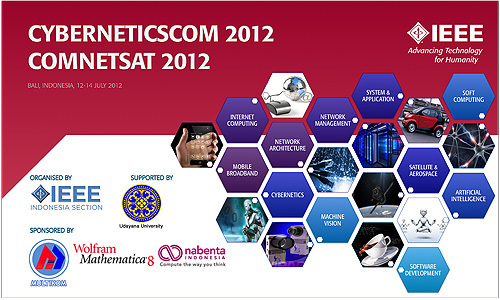 IEEE CYBERNETICSCOM and IEEE COMNETSAT are officially launched on Thursday, July 12, 2012. The conferences were located at Inna Grand Bali Hotel, Sanur Beach. COMNETSAT is the IEEE Conference on Communication, Network, and Satellite; while CYBERNETICSCOM is the IEEE Conference on Computational Intelligence and Cybernetics. Jumped out from my role as TPC member and Organiser, I served at the opening ceremony as the clumsy MC. The General Chair, Dr. Ford Lumban Gaol, formally opened the conferences. M Ary Murti, the IEEE Indonesia Section Chairman, delivered a welcome speech, including a brief about the IEEE and the Indonesia Section. The first keynote speaker, Prof. Michael Lightner, the IEEE President in 2006, delivered a keynote speech for CYBERNETICSCOM, titled Machine Learning for Assistive Technology. Lightner began with a concern that a very large number of humanity experience disabilities at various levels. Researches in the field of assistive technology lead to some improvements to the value of human life by various measures. Initially we applied some tools for the improvement; but then also we use some agents implanted into the human body. One material that was presented but-not-shared related to a research to bypass the brain to overcome the problems caused by short-term memory impairment. Prof. Byeong Gi Lee, the Past President of the IEEE Communications Society (Comsoc), then delivered a keynote speech for COMNETSAT, themed Convergence of Communications Toward Smaer Era. BG Lee described how the revolutions in communications and digital information had affect each other in the cultural and social life of human being; how the context processing becomes increasingly important for the development of intelligent systems that will better understand and enhance the human life. After the opening session, the conferences were spread into paper presentation sessions in several rooms. 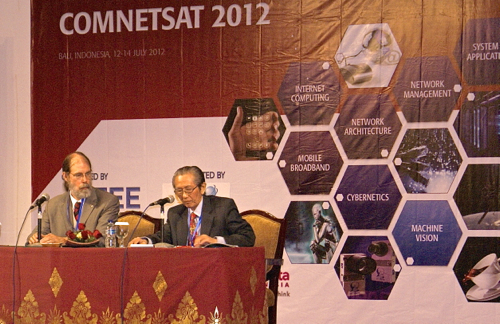 As a member of the Technical Program Committee of COMNETSAT, I was active in COMNETSAT. I occasionally served as a session chair, or to appoint session chairs from the conference participants at each session, or just as an observer. Between there were networking, gaining new friends, gossiping the future of cognitive radio and various variants of 4G, and sharing some technology updates. Between sessions, I also say Prof. Lightner and Prof BG Lee being active in the sessions, put sparks in the discussions. In some ways, these conferences were more amazing than TENCON :). On the last day, Saturday, July 14th, we held a Plenary Speech of Prof. Pramod K Varshney. In his speech, he explored the philosophy and implementation of Cognitive Radio Networks. An interesting topic. Indeed I myself has discussed it at an IEEE Public Lecture session carried out at ITTelkom Bandung the other month. The Sanur Beach was still as cool as what I saw previous years. Soft and white sands help to banish fatigue and tension result from the conference. The squirrels (yes, messieurs et mesdames, squirrels) jump among the coconut trees and frangipani trees to make fun of the days. But surely there are many other cool places throughout Indonesia for the COMNETSAT, CYBERNETICSCOM and other technical meetings we will carry out the next years. For the advancement of the profession, technology, and humanity.